Ghostbusters is a movie that needs no introduction, most people remember it from their childhood in the 80's and is just one of those movies from the "Master system era" that everyone is guaranteed to have saw and loved. I remember seeing the film for the very first time and actually being scared. 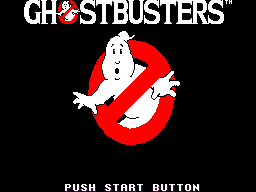 Times changed and after that I became pretty obsessed with all things Ghost busters related, I had the toys, the t-shirt and the lunchbox etc, so it was of little surprise to my parents when I asked them for the game for my favourite console. I got this game as a present from my dad just as he got a new job and was feeling a bit fly with his cash, I remember the game cost him £35. I couldn't wait to get this game home and give it a try. I got home and eagerly stuck this cart into my Sega, I recall being very excited because at this time the Sega Master System did not enjoy the same library of movie licensed games that another 8-bitter did. This was my first movie licensed game. I have to say that initially after putting the cart in I was a bit disappointed, mainly because I did not really understand the game, It took about a week of playing before I really knew what I was doing, and the game is one of those games that actually surprises you as to how complex an 8-bit game can be to get to grips with. This is one of the few games on the SMS that I found myself actually reading the manual! The gameplay in this game is still quite unique to this day. At the start of the game you are given a bank loan with which to buy your equipment, thanks to Poor Ray taking out that second mortgage on his parents house. You get to choose between 4 cars, one of which is the Hearse. There are various special types of proton packs, traps etc, and a few special extra items such as Marshmallow-man bait which is the only way to stop Marshmallow-man from destroying city blocks(and the mayor charging you for it). After you purchase your initial equipment you are presented with a overhead map of the city, this is where most of the game will take place, it can seem quite daunting at first but once you get used to it its pretty cool, the basic idea is that you control the Ghost busters symbol, at any time buildings in the city will flash, which signifies high P.K. energy readings, if you go to those buildings and press the button on the map you will appear inside your car driving to the building. On the car scenes there are obstacles to dodge such as other cars, road blocks, but there are also ghosts along the way which you can capture providing you purchased the "Ghost Vacuum" from the shop. Once you arrive at your destination you will appear outside the building and you will have to capture the ghosts, this part is especially cool, your 2 characters will hold the trap, you first have to put down the trap and then move the other man to start firing his proton stream at the ghosts, you have to get the ghosts directly above the trap and then open the trap to capture them. If you miss one ghost with the trap you will be attacked and won't be paid. The game continues much like this until on the map screen the cities P.K. energy readings reach red levels. At this point you will start being attacked by the Stay-Puffed Marshmallow-man. And eventually Zool will appear in the centre of the map, you need to have at least $10,000 in your account by the time Zool appears or you will not be able to go any further in the game. I learned this the hard way. 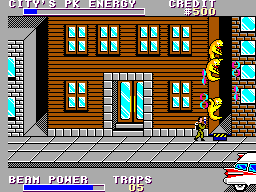 The end part of the game is defiantly the most exciting part of the game, you appear in front of spook-central and first have to get into the building past Mr Marshmallow, this part is pretty straight forward matter of getting three of your men past him. Once you do this you will be inside spook central, and have to fight your way to the penthouse apartments past hordes of ghosts in order to reach Goza. The final battle with Goza is pretty fun top-down shooting scene, the variety this game offers is very impressive for an 8-bitter but its just too short. Once you defeat Goza you will get a code at the end of the game, which will enable you to start the game with whatever money you had. This in my opinion only makes the game easier, but it does allow you to try all the premium equipment in the shop. All in all the game play is amazingly diverse for the Master System title, there's a bit of everything included, its just a shame that most of the game is played out on the overhead map scene, it would have been much better to have more side-scrolling shooter parts. The graphical appearance of this game is pretty basic, I remember thinking that the overhead map view was a bit of a cop-out from creating good graphics all the way through, but there really is so much variety in this game that the graphics are not that important. The ghosts are done quite well, there is quite poor animation all the way through, but this can easily be forgiven once you get into the game a little. The best graphics in the game are possibly near the end when trying to get into spook central and you see the Marshmallow-man leaping around. Very nice. Shame about the weird scaling down of him, but this is to be expected. The music for the game is taken directly from the movie, if you haven't heard the Ghost busters theme then you've been living under a rock. The music does get a little annoying since there is only one track all the way through the game, but the track is decent. Sound in the game is not great either, there seems to be a very limited amount of sound samples used throughout the game, but again this isn't really that important. I'm pretty glad to say that the controls for this game are very good, especially the parts where you have to catch ghosts, putting the trap down etc, its all very well done, and make playing through this game a breeze. I have played this game many times since I first completed it, the game is very short and this usually means poor replay value, but in the case of Ghost busters it does actually have quite a high replay value, It will take a while before you can complete the game with one hand tied behind your back, its also fun to experiment with the different equipment you can buy, the different cars etc all add variety which makes the game worth playing over. Ghostbusters is a truly great game, I know many people that will totally disagree with me on this review, but I have spent many hours playing this in the time I have owned it. If you don't believe me you can pick up a copy from eBay for under a fiver, try it for yourself!